Categories: A Ladies Choice (Women), Latest Creations, Necklaces, One Of A Kind. 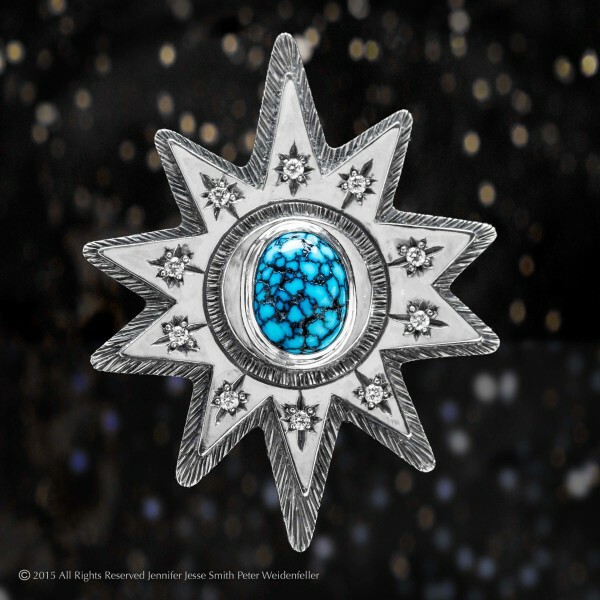 This was whispered in my ear by my Navajo friend…”We call turquoise the sky found beneath the earth.” This sent me into a creative fervor and I created this pendant. Engraved on the back ~ The Sky Beneath The Earth. With the one of the worlds rarest and most beautiful natural turquoise stones ~ Black web gem. It also features 10 SI1 Diamonds and is hand fabricated in sterling silver. Tags: Diamonds, Jennifer Jesse Smith Jewelry, Star, Turquoise Jewelry. The Sky Beneath The Earth Pendant created with one of the world’s rarest and most beautiful natural turquoise stones ~ “Black Web Gem” turquoise. It also features 10 SI1 Diamonds and is hand fabricated in sterling silver. One of A kind.